Hi. 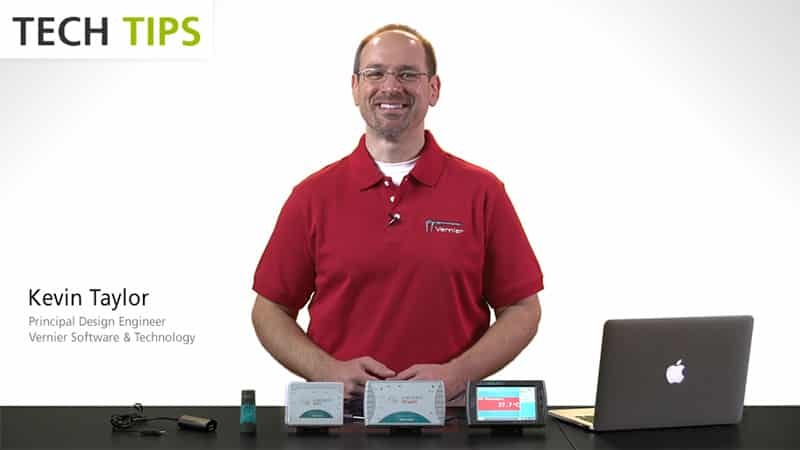 Tom Smith here, with Vernier Software & Technology. 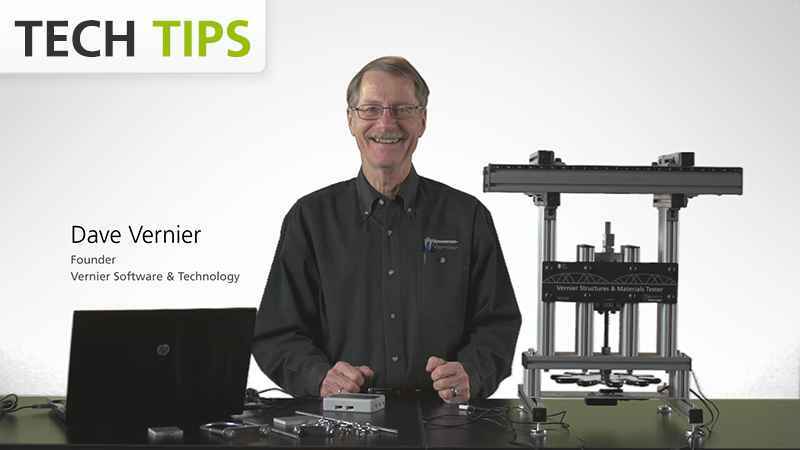 Today, I want to talk to you a little bit about the Vernier Structures & Material Tester. The Structures & Materials Tester is a very versatile and robust piece of equipment for any physics or engineering classroom. We've developed a series of experiment files to support its use in the design process of structures, conducting bridge or truss building competitions, and evaluating beam design. Today, in this video, I'll illustrate its use in the evaluation of the design of beams. 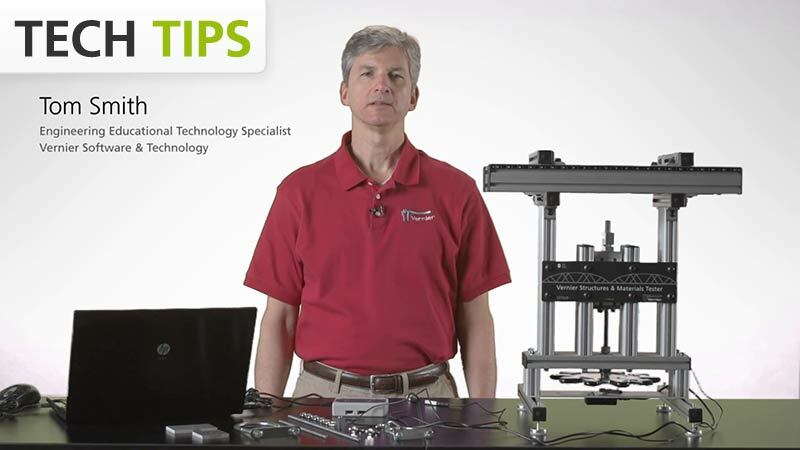 The Vernier Structures & Materials Tester has two sensors. It has a force sensor that is just a simple strain gauge that allows you to measure forces up to 1,000 newtons. The displacement sensor, seen underneath here, under this carriage, basically counts as the wheel is turned. As you rotate the wheel, it's measuring how many rotations it's going around. It translates that into a vertical translation as the force sensor is pulled down, when you rotate the screw. I'll rotate it back up now to get it back up into a starting position. You're able to measure to a 10th of a millimeter for the resolution on the displacement sensor. The deflection of a beam, if we consider just a simple plank like this, you can tell a lot about a beam like this simply by looking at its orientation, the dimensions of the beam. If I try to flex the beam when it's oriented like this, it's fairly easy for me to bend it. If I turn it on edge, however, and apply a force up and down, it's very rigid. So the orientation of the beam and the direction of the forces applied make a big difference as to the amount of flexibility that you see in a beam. The study of deflection, due to a force applied to a beam supported on both ends, is a real common component of engineering classes investigating the properties of materials. There are a couple of questions that students might ask when they're investigating a beam in this nature, that's supported on both ends and a force applied to the center. The first question might be, "How does your choice of material affect the amount of deflection?" The second might be, "How does that configuration of the material affect the amount of deflection?" I have three beams here that are constructed slightly differently. This is just a rectangular beam. That's going to have much different properties than a beam that's an I-beam. And this beam has even more of its mass distributed away from its center. It's going to have different properties associated with the amount of flex that it has when a force is applied to that particular beam. I have an experiment file opened in Logger Pro and I guess at this time, it would be appropriate for me to connect the sensors to LabQuest Mini. You could plug it into a LabQuest Mini, you could plug it into a LabQuest, or a LabQuest 2, or a LabPro. All of those interfaces would be appropriate. Let's see. We need the force sensor in an analog port and we need the displacement sensor in the digital port, like that. And then I have this connected to Logger Pro on the computer. The experiment file that I have open is called Elastic Modulus Moment of Inertia. It basically allows us to investigate this relationship between the dimensions of a beam and the force being applied to it, and the amount of deflection that you see as a result of that. There is an equation that kind of drives this whole relationship that I'd like to present to you now, just as an introduction to how you might think about using this experiment file in your classroom. The equation basically states that the change, the flexibility, or the deflection associated with that beam is going to be related to the length between the two supports. That length cubed times the force that's applied, divided by the product of 48 times the moment of inertia by area, times the modulus of elasticity. The modulus of elasticity is really an indication of how stiff or flexible a material is in its nature. If you have a higher number for the modulus of elasticity, it's going to be a stiffer material. If you consider the moment of inertia, the moment of inertia is a measure of how the mass is distributed relative to the center of the beam. If I take a look at this beam, it has some of its mass towards the center, but a good portion of the mass is distributed away from the center. So, this would have a higher moment of inertia than say, a dowel that has all of its mass and material focused really close to the center of the beam. In the experiment file, the first page that we have set up requires a few entry points for you to enter information about the beam that you're going to be testing. As you can see here, you're going to enter the base of the beam, the height of the beam, and the length of the beam. The base, height, and the length. If I consider a rectangular beam, I happen to know that I've already entered data for the base and height here. It's one centimeter in width and 3.6 centimeters high. I need to look at my supports to see how far apart the two supports are. Both of these start at 12 centimeters from the center, so I need to increase that to 24 centimeters for our length. There we are, 24 centimeters. All the data is input there. I'm attaching the beam with some of our tackle that comes with the bridge tester. In particular, I'm going to use a U-bolt and a couple of quick links, and that should give me enough reach to attach my beam to the top of the Vernier Structures & Materials Tester. In order to do that, I need to reach around here and put an I-bolt into the top of the loads of the force sensor, like so. I have my quick link open. I should be able to reach around and just attach that. It's important when using quick links, to go ahead and thread them closed so that they aren't stretched when you apply force to them. Now I take this beam and just slide it underneath here to get it centered on the two supports. And then we can wind this down. We don't want to put any tension on it yet, but we do want to get the tackle snug so that the displacement is lined up with the force. So we just get that... Maybe back it up just a little bit, so that we don't have any force there but we do have tautness in the tackle. We have already set up the Logger Pro to be ready to test. But an important feature is that we need to wear our safety gear, just in case we get some splintering wood flying off of there. We want to make sure that we protect ourselves for that. Okay, so I think this is all set. I need to zero my scales here. So let me just do that. And hit OK. Now we're ready to collect our data. Again, we're just going to be able to calculate the modulus of elasticity from this test, measuring the force and the displacement as we crank this down. You can see the force increasing and I'll go ahead and stop that there. I'm getting a little tilt in my beam, so that's okay. Auto scale both of these so that we can take a look at the data. And based on this, this is obviously when the beam fell over. If we take a look at probably this section of data through here, that's going to represent an average modulus of elasticity, for that particular beam, before it began to tip over. If we take a look at the stats button, we can see that the statistics would tell us an average modulus of elasticity of 6.6 or 6.7 times 10 to the eighth pascals or newtons per meter squared. So, in this experiment, we were able to determine the modulus of elasticity for this particular beam. And we determined that we're looking at about 5.6 times 10 to the eighth pascals or newtons per meter squared, for the modulus of elasticity for a rectangular beam. Earlier today, we tested a couple of I-beams. I'll just show those to you now. So, here we have two I-beams that we tested earlier today. You can see that this one's fairly sturdy, but the mass is more centered around the center of the beam so it has a smaller moment of inertia. Here's another beam that failed rather catastrophically. More of the mass is distributed further away, so you might expect it to have a larger moment of inertia and be stiffer. But how did it stand up to the forces applied to it? This one was tested first, and now we'll cut away and look at the data as it rolls on Logger Pro. You can see that the beam is actually collapsing to the side because of the nature of its construction, moreso than the nature of the beam itself. So, there we have a failed beam. And we have some data here that indicates both the force applied and the moment of inertia. I can stop the experiment and we can auto scale those two graphs. And let's see if we can make some prediction about this beam. This one will be more sturdy or less sturdy, more flexible or less flexible, as we run it through a test. In order to compare these side-by-side, I want to go ahead and save this data, so I'm going to say store latest run, and we should be able to run side-by-side data collection here. l'll hit collect again and begin to apply a force. You can see the force applied is much greater, already. You can see the calculated moment of inertia on the bottom and there we have failure of that beam. And that's the Vernier Structures & Materials Tester, as it applies to testing beams in your class, a great opportunity for kids to experience engineering in their engineering courses or physics classes. For more information, please go to our website at vernier.com.